Today you get to meet my brother Andy (aka Little Fro). I’ve been promising him a shirt for over a year and I’ve finally delivered! This lovely black and white pin dot brushed cotton is from Stone fabrics and also comes in blue and red. I presented samples of each to my brother, white was chosen and then we were off! The shirt is a rub-off of an Austin Reed button up that Andy owned. He picked it as the copy garment because he was happy with the fit and style of the shirt. I used the Steffani Lincecum book that guides you through copying ready to wear clothes. She also has a Craftsy class on this technique but I think the book is sufficient enough to grasp what you need to do. Sunni did a good post which convinced me to get the book. I used a few different sources to understand the logic of sewing a man’s shirt without a pattern; like the MPB Men’s Shirt Sewalong, plus this great Shirt Sewing Blog’s post on two piece plackets that gave me food for thought, and finally this post has a helpful image about the subtle variety in collar shapes which I have to say I was ignorant of before. Sadly I definitely couldn’t get my head around the burrito method and I’m one of few people who didn’t get on with Andrea’s tutorial for sewing collars in a different order. There were a few funny things about the source shirt. First, it had different sized front plackets. 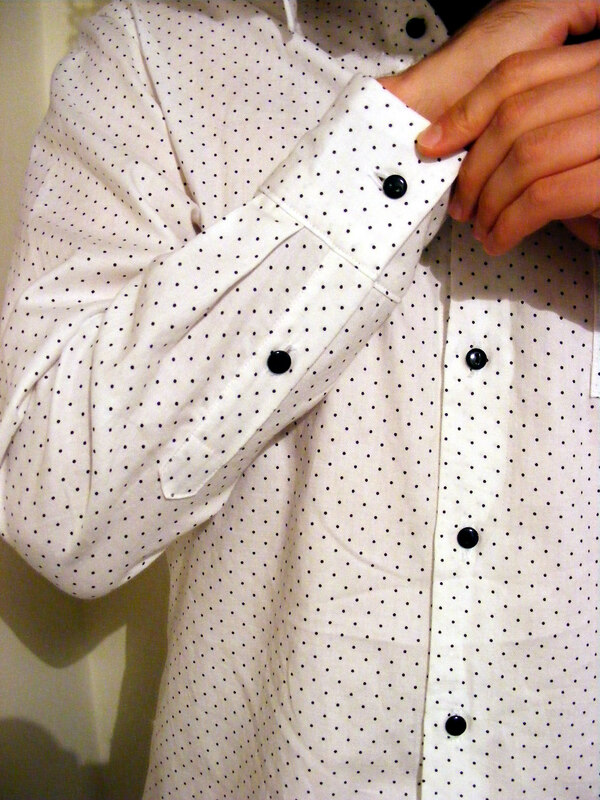 The side with the buttonholes was wider than the button side, and it wasn’t topstitched. Also the shirt had a mixture of flat felled seams (down the sides and sleeves) and French seams (at the shoulders and armholes). Is that normal? Plus the seams were a mixture of widths too. This meant I had to label my pattern pieces really clearly or I would have totally confused myself! It was really nice to learn classic sleeve plackets with this project. To help myself, I bought an 90s McCall’s Ladies Shirt pattern from a car boot which has amazingly detailed (and rather witty) Palmer Pletsch instructions, while also having the Coletterie Hawthorn sewalong placket post open on my screen to look over their lovely clear photo steps. Have you ever sewn a shirt? How did you find the topstitching? I’ve worked out I can use my new stitch in the ditch foot to edgestitch if I move the needle position. It made it SO MUCH EASIER. I’ve heard a blind hem foot works too. Don’t the black buttons look like big polka dots? They do have two holes (rather than being shank buttons) but by using black thread to attach them the holes sort of disappear! I finished the hem with home made bias tape from the same fabric. This technique seems to be getting loads of attention all of a sudden but I’ve been doing it for ages on blouses, glad everyone else it getting on it because it makes hemming a curve so much easier. We had some fun photographing the shirt. 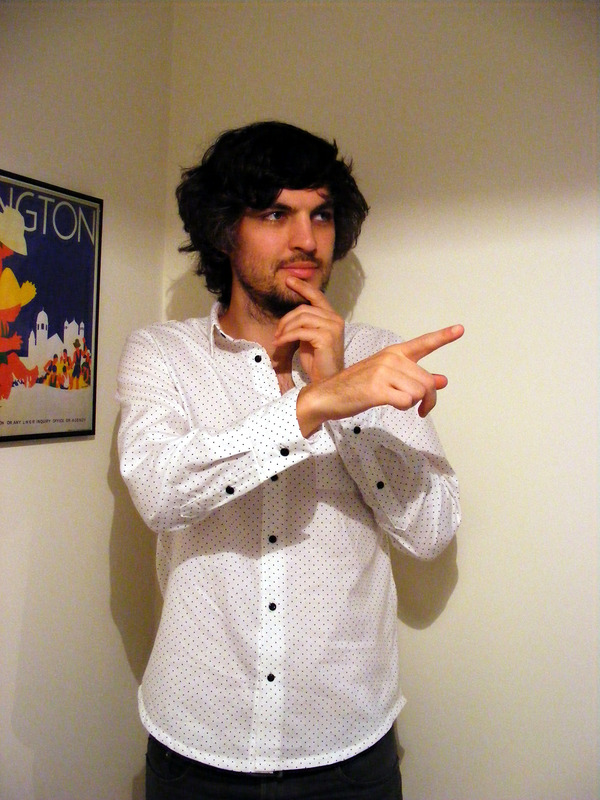 I got Andy to break out his best catalogue poses. Bwahaha. 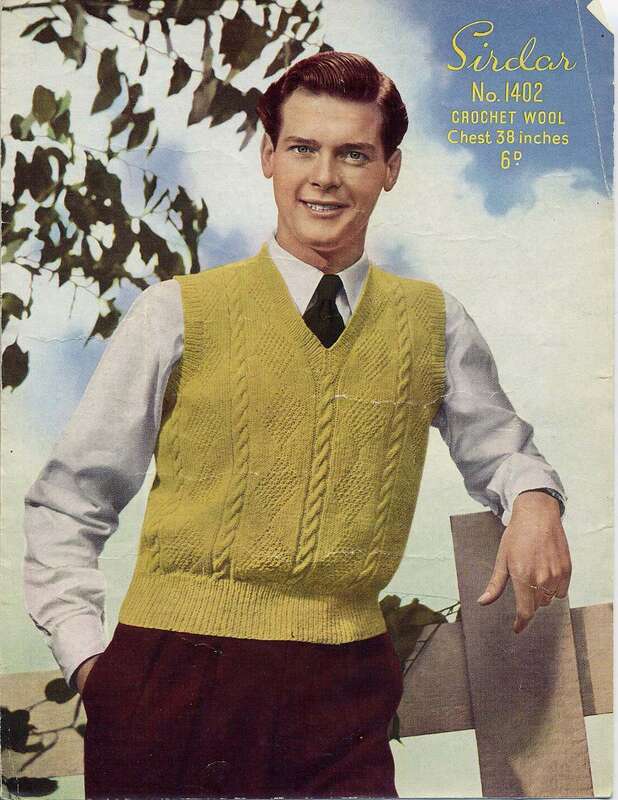 Reminds me of Roger Moore who started out as a knitwear catalogue model and Michael Caine loved to tease him about it, calling him “The Big Knit”! I wholeheartedly recommend his autobiography; even if you’re not James Bond mad like me, it’s SO much fun to read. Now I have orders from three other men in my life to stitch them shirts. Phew! Wish me luck. Amazing! You clever little thing you… I hope your brother realises just how complex shirts are not to mention rub-off requires some real patience and detailed work. But I have to compliment him on his fabric choice… even if you did give him a shortlist! Wow! I can’t believe you drafted this? It really came out amazing, fits your brother so well who is rivalling Roger Moore’s model stance. I looked at the burrito method. ?? But, I’ve never sewn a button down shirt or blouse so it may make more sense once I have the pieces in front of me. I like the black buttons a lot. They unstuffify a crisp white shirt. Awesome work, such a crisp looking shirt. Thanks for posting all those links too. Really useful! Cheers M’dear! That is a good trick. I’ve used that on baby hems before. You’re smart to make the fabric work for you to get a neat hem. well done!! It looks v profesh and that you rubbed it off is even more impressive !! 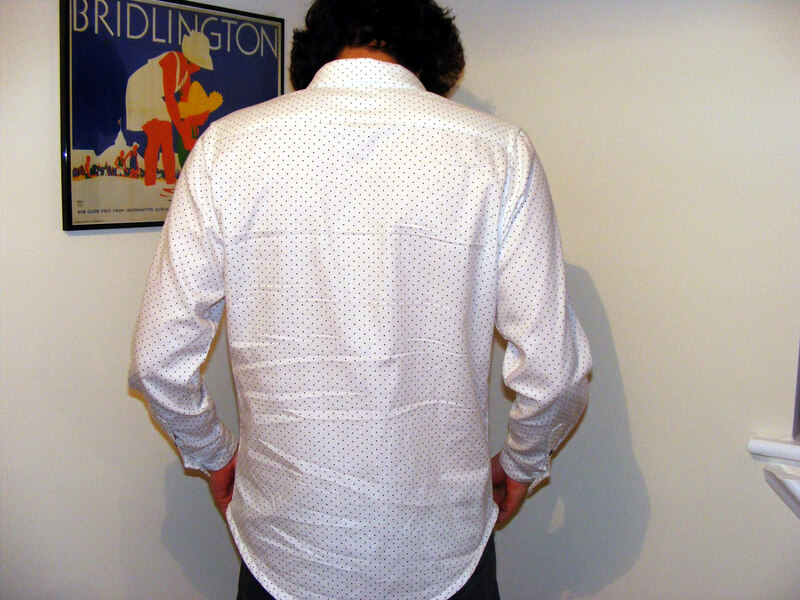 I’m shirt making at the mo too, a December birthday, then christmas. Some useful links, thank you. I may look into bias hemming, if I remember in time! And great poses!! This looks great and I am soooo impressed you didn’t even use a pattern! I also love the fro 🙂 The book sounds great, thanks for sharing – I just reserved it from our library, Yay. Thank you so much! Little Fro has been carefully getting his hair as big as possible ready for his photoshoot heehee. Enjoy the book! Thank you! And excellent rhyming! 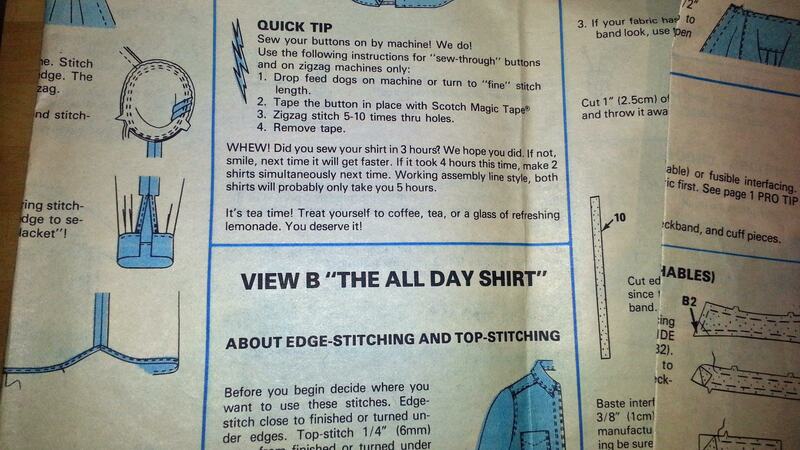 You are your own worst selfless sewing enemy after creating such an awesome shirt! No wonder more doers are coming in- this is fantastic. Also, epic poses there, BroRock! Heheh as long as I still get time to sew for myself then I suppose a little selfless sewing isn’t too bad. He loved posing and pouting for all you lovely ladies too. That is one awesome shirt and one fearless brother who has some epic posing skills! I just have to make sure that Husband doesn’t see this post as whilst he takes the mick out of my sewing (he deliberately calls it knitting!) I think he’d love a me-made shirt for special occasions (plumbing doesn’t call for then as day wear). I’m seriously impressed that you rubbed off / drafted this too, and kept a handle on all those different seam allowances – I think I’d lose my mind!! Heeehee he loved being a model for the day. My other half suddenly revealed he wants a special occasion shirt too. I think I’d upset him sewing for my brother first, but I told him it’s all practice so I can make him and even better shirt! This is absolutely fab. 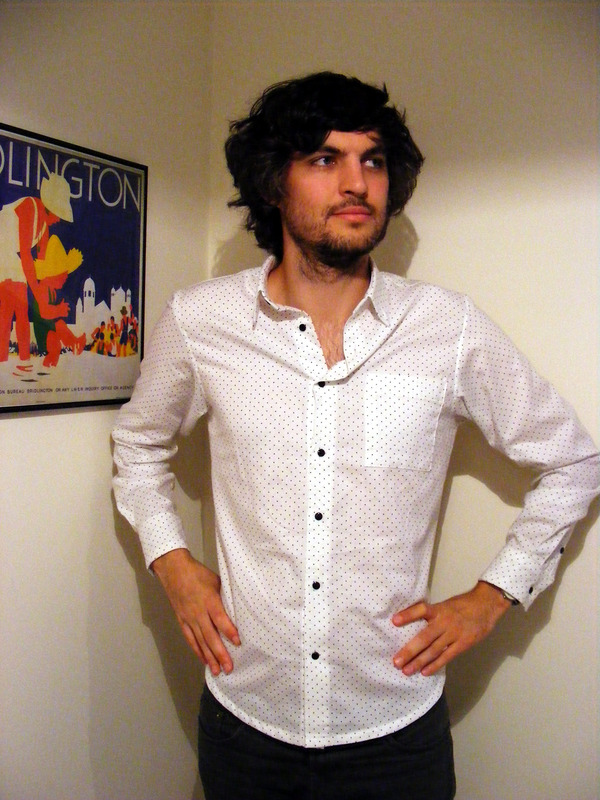 I love checking out man shirt sewing that’s going on in the sewing community. It’s inspires me to make more for Tim. BUT, the fact that you rubbed this off another shirt makes it even more impressive. Well done! Roger Moore eat your heart out! A young dude is taking over in the modelling stakes! 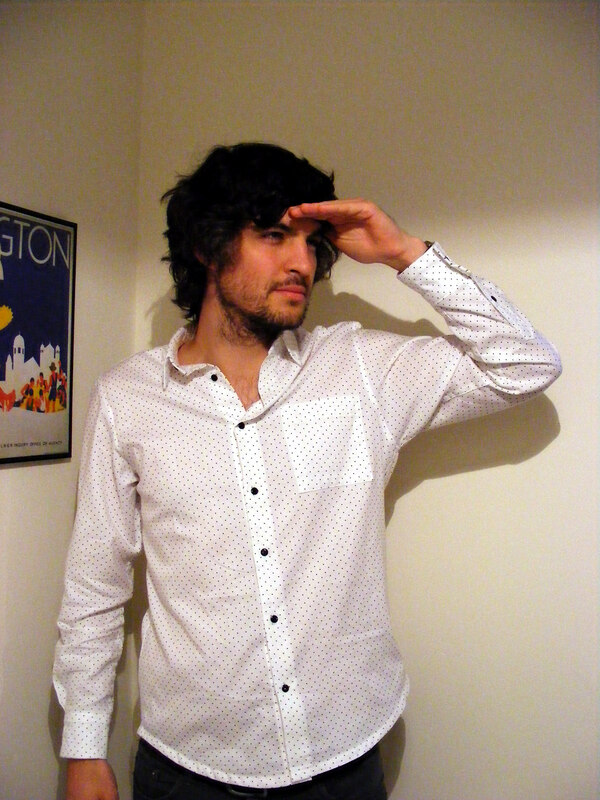 Amazing shirt,loving the poka dots. Well done on such an amazing make. Your brother is a lovely model – in all respects. He’s so lucky to have such a talented sister. I’ve never tried a shirt, and wouldn’t ever try to copy a RTW item. I think you are amazing. Thanks so much! You’re very kind. He was grateful which made it worth it. This looks amazing! I am so impressed and it looks like it fits your brother perfectly. This looks so professional! Those sleeves are really amazing and so perfect! I’m very impressed! Boy shirt making is a game I haven’t got the patience for, girl shirts are bad enough- all those plackety things, ughhh, but this shirt looks so worth the trouble, well done! I am amazed by all of your makes over the past few months! Awesome!